Pronounced “Ka-nobs” because it annoys Gillian, I finally got around to putting knobs on the kitchen cabinets. Actually, I would like to thank Howland, Gillian’s uncle, who happens to own the Cabinet Factory Outlet and mailed us a package of 50 knobs after we mentioned it a few weeks ago. It is good to know people, Thanks again Howland. Get my PE license – This should hopefully be accomplished by the beginning of April, though I won’t know the results until August. Get my eye fixed – Yes I have been talking about getting lasik eye surgery done since I graduated college and now, thanks to my new CNH insurance, I can sock away the money to do it. I will probably wait until after my PE exam, just in case my eyes fall out. Loss Weight – I started actively trying to loss weight through dieting and exercise on December 1st and so far I have lost about 15 pounds, so far so good hopefully I can keep it off. Look for future post about my successes and struggles with this one. Finish the $#%^ing Engine for the Falcon – Notice how I didn’t say finish the Falcon, I am setting the bar fairly low on this one. I just want to finish rebuilding the engine and get it back in the car. Not necessarily get it running, just get it off the engine stand and under the hood so I can work on it like it is a car instead of pieces of a car. 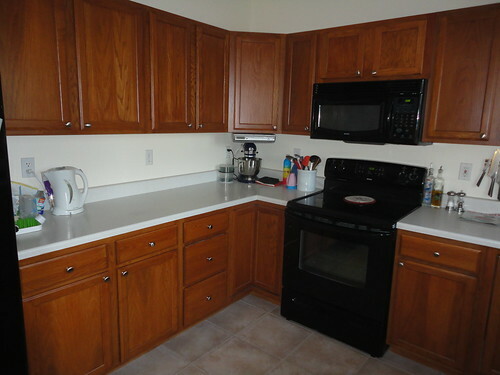 Put Knobs on the Kitchen Cabinet – Done and Done! Paint the Ceiling – Gillian’s folks recently did this along with most of their walls and it really makes everything look crisp and clean. Of course this was suppose to be something we did before getting new carpet, which we got over a year ago. Install the sink in the Garage – This is one of those, I have all the parts and tools and know-how to do the job I just ran out of steam one weekend and never went back to it. I have the sink in the garage, it looks like it should work but none of the plumbing is hooked up. So why am I posting all of this? Why should you care? Well you really don’t have to care but it is my blog and to be a good card-carrying member of the internets I have to rant like a crazy person every once in a while. I have also decided that if I don’t get these things accomplished in 2011 then I am not allowed to talk about “getting them done” ever again. Not that I wouldn’t still get around to finishing them even if I miss my deadline but I am just not going to talk about it any more. I have always thought actions speak louder than words and I feel like I have been using way to many words lately. This entry was posted on February 12, 2011 at 3:25 am and is filed under Rants. You can follow any responses to this entry through the RSS 2.0 feed. You can leave a response, or trackback from your own site.